Kids Plus believes in our clients getting the most out of their therapy programs. Providing a short block of intensive and focused treatment creates opportunities for improvement and achievement of your child’s goals. 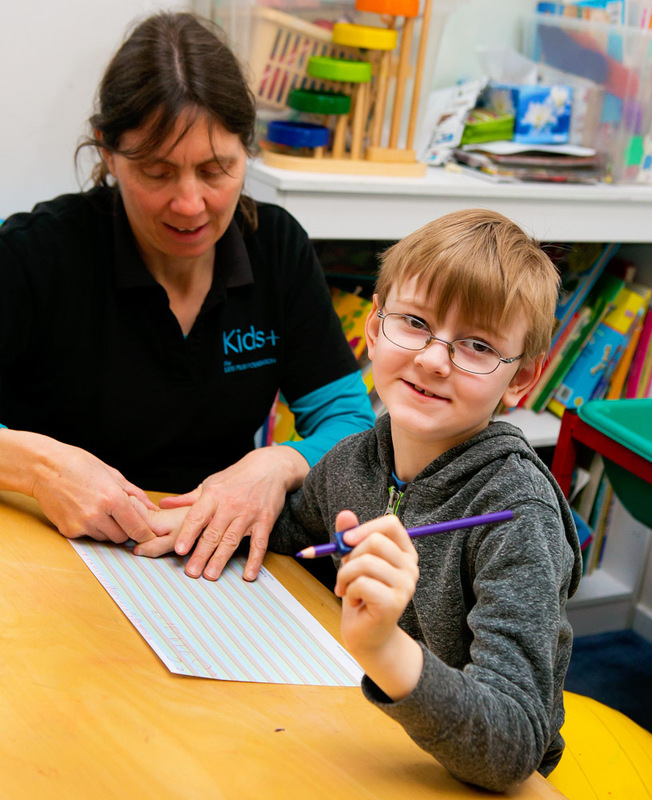 Intensive programs at Kids Plus are individualised to the needs of each child. They deliver best- practice therapy interventions to promote aspects of your child’s development that enable them to explore and interact with their world. The main aim is to encourage your child’s own movement and functional abilities in more typical ways. In-depth analysis of your child’s abilities as well as intense and repetitive practice of tasks and goal specific activities over a short time period results in a cumulative gain and greater retention of skills. It supports motor learning and neural plasticity for infants, children and adolescents with neurological disorders like Cerebral Palsy. home exercise program to enable ongoing practice and consolidation of skills. A basic Intensive program will involve 1.5 hours of therapy per day and the program will run over 5 days. Your child can attend 1 to 2 sessions a day, or you may choose to combine 2 therapies into one session. Co-treatments are useful when the goal area requires specialist knowledge and input from different disciplines, for example a Speech Pathologist and Physiotherapist working together towards a communication goal. Our team of therapists will create a playful and fun environment to maintain engagement and energy levels across the length of the sessions. Prices will vary according to your child’s age and your specific program but will be in line with NDIS pricing. (2 therapists in 1 session) are double the rates. We accept funding from NDIS, Better Start Initiative (BSI), HICAPS, and Medicare Health care plans. Written confirmation of your attendance at the Intensive therapy program is required 30 days prior to the Intensive program starting, to secure your place. Cancellation fees may apply of up to 90% of the session cost if you make a short notice cancellation or fail to attend a scheduled session. Kids Plus can subsidise accommodation for families if required. Session times are 9 to 10.30am, 11am to 12.30pm, 1 to 2.30pm, 3 to 4.30pm. It is a short block of individualised, intensive and focused therapy sessions to enable your child to reach their goals over a shorter time. It is useful when learning a new skill or to move up to the next level with an emerging skill. Programs are goal-directed with specific interventions that encourage your child’s own movement and functional abilities in ways that are more typical. What activities will take place during the sessions? Our therapists will begin by setting goals that are important to you and your child. They will then assess your child’s current performance and provide in-depth analysis of your child’s abilities within these goal areas. The Intensive program will include hands-on guidance and practice of movements, or components of movements, required to achieve these goals. The therapist’s inputs provide alignment, as well as opportunities to practice and refine the task with specific feedback and correction. The weeklong program provides opportunities for intense and repetitive practice of tasks and goal specific activities. Therapists use a ‘play-based’ approach to engage your child and keep them motivated across the week. This contributes to greater involvement and enjoyment for your child when attending therapy. How many sessions will your child attend and over how many days? A basic Intensive program will involve 1.5 hours of therapy per day over 5 to 6 days. Your child can attend 1 to 2 sessions a day, or you may choose to combine 2 therapies into one session. Co-treatments are useful when the goal area requires specialist knowledge and input from different disciplines, for example a Speech Pathologist and Physiotherapist working together towards a communication goal. Programs can be tailored to meet your needs. What will happen at the end of the program? To keep up with your child’s good work during the intensive therapy program, our therapists will provide you with a pictorial home exercise program that will ensure your child maintains the new abilities and skills gained. What should you do prior to attending an Intensive therapy program? Complete and provide us with your intake forms. Supply any recent medical reports, assessments, etc. along with funding assistance paperwork. What should your child wear during the sessions? The ideal outfit worn during an Intensive therapy program is a lightweight t-shirt or singlet and/or leggings and shorts. Loose fitting or baggy clothing such as tracksuit pants or jeans are not recommended. Please bring along some socks and some stable shoes. Any orthotic or assistive devices, including communication resources, should be brought along to all sessions. What should you bring whilst attending the Intensive therapy program? Healthy snacks, lunch and water/drink bottle for your child, siblings and yourself. Or any feeding needs and formula. Small amount of favourite foods if your child is doing feeding therapy. Regular shoes that fit without AFOs or any supportive soft shoe. Equipment your child needs/uses/you’d like them to practice with, eg. AFO’s, braces/wraps, crutches, walkers and wheelchairs, communication device/method etc. Favourite toys and books or prises for a great day or week. Tablet with shows or music for motivation when therapy gets tough. An extra change of clothes, nappies and wipes in case of an accident.